In the sixth grade, youth begin to be accountable for their spiritual growth as part of their Catholic commitment. Of course their spiritual growth is a lifelong endeavor! The Christian Formation program requires Middle School and High School youth to complete 1 retreat per year through the parish. If a youth cannot attend a parish retreat, he/she is expected to make another retreat on his/her own. Please use the Service and Retreat Log to record the times that you have gone on retreat. If you are unsure about an activity, talk to a Christian Formation staff person. The biggest criteria is taking time to open yourself to an experience of God’s transforming love. Some of the retreats offer the Sacrament of Reconciliation. Check out How To Go To Confession, Video: Confession 101, and the Examination of Conscience for High School Youth. You can print out the Act of Contrition and bring it with you! You can also have it on your phone – download or use the free app Laudate. Retreats also sometimes include praying the Rosary. Check out How to Pray the Rosary. 8th Grade: Saint John Bosco Youth Day – Please do NOT register online! Saturday, October 6 from 8:15 am to 6:30 pm at the Basilica of the National Shrine of Mary, Help of Christians, at Holy Hill. Transportation is by bus from QOA’s parking lot. Please eat breakfast at home. Includes lunch. Mass fulfills the Sunday obligation. Opportunity for Reconciliation. Bring clothes / blankets for outdoor weather! Optional to bring water, kneeling pad, rosary, and money for religious items. Adult chaperones are needed – must meet Safe Environment requirements. Permission Slip due by class on September 30. 6th-8th Grade: NET Retreat -- Saturday, December 1 at St. Dominic’s in Brookfield. Time 11a.m. to 5:30p.m. (we will end with 4:30p.m. Mass) Lunch included. NET stands for National Evangelization Teams. Teams of young adults, ages 18 to 29, devote a year to leading youth retreats around the country. More details to come! Saint John Bosco Youth Day – Please do NOT register online! Saturday, October 6 from 8:15 am to 6:30 pm at the Basilica of the National Shrine of Mary, Help of Christians, at Holy Hill. Transportation is by bus from QOA’s parking lot. Please eat breakfast at home. Includes lunch. Mass fulfills the Sunday obligation. Opportunity for Reconciliation. Bring clothes / blankets for outdoor weather! Optional to bring water, kneeling pad, rosary, and money for religious items. Adult chaperones are needed – must meet Safe Environment requirements. Permission Slip due by class on September 30. Laudato Si’ Project – Saturday, January 12 from 9:30 am to 5:30 pm at the Basilica of the National Shrine of Mary, Help of Christians, at Holy Hill. Joe Meyer of the Laudato Si’ Project will lead us in a discussion and a hike on the Ice Age Trail! Bring clothes for outdoors – rain, snow, or shine! Transportation is on your own. Please eat breakfast at home. Includes lunch. Family and friends are invited for Reconciliation at 4 pm followed by Mass at 4:30 pm. Pre-work required and provided – read “On Care for Our Common Home – Group Reading Guide” by Bill Huebsch which is a summary of Pope Francis’ Encyclical “Laudato Si’”. Adult chaperones are needed – must meet Safe Environment requirements. Permission Slip to come! 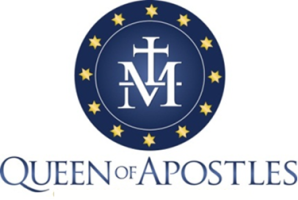 Holy Thursday Encounter – Thursday, April 18 from 5:30 to 10 pm at Queen of Apostles. The evening will begin with a simple supper and a discussion of the Holy Thursday service. We will attend Mass at 7 pm which includes a washing of the feet and a procession of the Eucharist to the Altar of Repose. After Mass, we will remember Jesus’ agony in the garden, arrest, crucifixion, and resurrection with movies, music, and other activities. The evening will also include time for keeping watch with Jesus in adoration before the Eucharist. Adult chaperones may be needed – must meet Safe Environment requirements. Details to come!